Another player whose career is hard to judge due to the disruption of war and the slightly odd nature of professional football in its nascent form. Shea was a local player who was discovered playing pub football and soon progressed to the first team where he was widely acknowledged as one of the finest inside forwards of his era. A brilliant and regular goalscorer throughout his career, he was the Hammers main goal threat in the period after Harry Stapley finished his career and before the outstanding group of Syd Puddefoot, Vic Watson, Billy Moore and Jimmy Ruffell appeared. He was sold in 1913 to Blackburn for a record fee of £2,000 and was good enough to go on and win England caps after playing at the highest level. He then returned to West Ham as a wartime guest player when he was again prolific, before finally transferring back for a second, and largely unsuccessful stint with us in 1920. Stop me if you think that you've heard this one before. In all of my research for this piece I determined that Shea might just be the least appreciated great player in our history. The bouncing Czech. It was no easy feat to replace the great Phil Parkes, but Ludek Miklosko was more than up to the task. A huge, wiry man he combined magnificent agility with no little bravery and a booming kick that regularly turned defence into something resembling attack. His form in the 1990/1991 promotion season was so good that he was a unanimous Hammer of the Year and was widely considered to be heading to Manchester United before they decided on Peter Schmeichel instead, with West Ham having been uncharacteristically reluctant to sell their star man. There was a sumptuous irony to this when, in 1995, Miklosko almost single handedly denied them the title on the last day of the season at Upton Park, with a string of fine saves. His form waned towards the end of his time, and a couple of high profile mistakes meant he lost his place, but few players have retained as much affection in the hearts of long term supporters. His name is still sung at each game today, although I do question how close Moscow actually is to the Czech Republic. A player who transcended the team in which he played, and who would have graced any West Ham side in any era. At his best, he was that good. Another astonishingly long serving defender from the Fifties, and also yet another plucked from the fertile feeding grounds of East London and Essex. I originally had him much lower before I realised just how good he was and for how long. Brown made his debut in 1953 and was talented enough to still be playing in a European Cup Winners Cup Final in 1965. That is some incredible longevity. A rock solid centre half for the length of his career, Brown picked up a solitary England cap in 1959 against Northern Ireland, which was huge local news at the time as no Hammer had been capped since Len Goulden in 1939. So pleased were the club that the entire playing and ground staff went to watch him play. Later, his son Kenny also represented the club with some distinction in the Nineties. A little like David Cross, Bryan "Pop" Robson is a name you hear whispered on the breeze if you are of a certain age, and yet probably don't know why. The answer lies primarily in the 1972/73 season when Robson won the Division 1 Golden Boot with a 28 goal haul, and somehow still didn't get an England call up from Alf Ramsey. Upon reflection now, it seems impossible to understand how this could have happened, but that lack of wider recognition probably explains Robson's lower profile with younger fans. It is probably also relevant that he isn't even the most famous Bryan Robson to have played professional football. His career was oddly circuitous for such a prolific striker, but perhaps his diminutive stature played against him in that sense. With that being said, he was a phenomenal header of the ball, and a brilliantly instinctive finisher with either foot. His greatest gift seems to have been a magical ability to find space in the most crowded of areas. As it was, he left for Sunderland in 1974 before returning for a second spell in 1976, meaning he missed the two cup finals in between - an unfortunate set of events. Unlike so many others, his return was pretty successful as he continued to score regularly right up until his departure at the end of the 1978/79 season. I have little doubt that some fans of a certain age will be aghast to see him outside of the top twenty on this list. If I have one quibble with the list produced by Blowing Bubbles, it is their failure to include Ian Bishop. I have written extensively about Bishop here so I confess to some bias, but as a stylish, elegant central midfielder I can think of few better in my time watching the club. With his long hair and tendency to overplay at times, Bishop was often mistaken for a soft touch, but anyone who watched him play in the Second Division and then in the Premier League will know that wasn't the case. At his best he was a classy, two footed passing midfielder who chipped in with the occasional spectacular goal and he was a worthy captain of the 1991 promoted side. As my article above notes, Bishop was also subjected to a huge amount of innuendo and malicious rumour about his sexuality, which seemed largely to derive from his hair. He was and remains a hero of mine. If life was tough for Bishop then it must have been almost intolerable for Clyde Best. He arrived as an 17 year old from Bermuda and in true West Ham fashion, nobody was there to meet him. He would soon make his debut against Arsenal amid a backdrop of racism and physical threats, including one particularly awful promise to blind him with acid if he played the following day. It seems inconceivable now but what Best endured was horrific, constant and debilitating. While some have suggested that he never fully realised his talents, it has to be put into the context of playing in such circumstances, at such a young age and in such alien conditions. A teenage Best is said to have been bemused the first time he ever saw English snow, for example. What helped him endure was a perfect temperament, remarkable physicality for his age and a supportive and progressive manager in Ron Greenwood. Fearsome in the air, and better with his feet than he was given credit for, Best would score 23 goals in the 1971/72 season to establish himself as an elite striker, outscoring both Geoff Hurst and Pop Robson. But Best was a player of greatness in all sorts of ways, and paved the path for the numerous brilliant black footballers who followed him. It is not an exaggeration to suggest that without players like him we would never have had the pleasure of seeing the likes of Rio Ferdinand or Trevor Sinclair in claret and blue. Significantly, he was also part of the West Ham team who beat Spurs on 1 April 1972 while fielding three black players - Ade Coker and Clive Charles also played. This was a first for an English club and yet somehow West Ham have allowed West Brom to garner the public acclaim for this, even though they did this later. While people argue over removing the World Cup statue from Green Street, I would much rather the club do something to immortalise that particular achievement. My only hesitation in writing this piece was around John Charles, who was actually the first black player to play for us. Charles wasn't as high profile but was also an excellent full back and seems to me to have been just as culturally significant as Best. Perhaps some older readers can enlighten me as to why they have such a different profile. Yet another very good, long serving full back who arrived as Britain's most expensive teenager and departed a club legend. Stewart was signed by John Lyall for a record £430,000 but he would repay that in spades over a glittering career that would include the FA Cup Final of 1980, the League Cup Final of 1981 and the third place finish in 1985/86. Along the way, Stewart would earn himself a reputation for fearsome ball striking and nerveless penalty taking. Among many famous efforts were the last minute winner in the 1980 FA Cup quarter final of 1980, and the added time Cup final penalty at Wembley to salvage a draw against Liverpool the following season. He also scored a very late twice taken penalty against Ipswich on my first trip to Upton Park, which moved us into second in 1986 and convinced us briefly that we were going to win the league. Like so many, the end of his spell was marred by injury and anyone who saw him in the Nineties saw a pale shadow of the high tempo, defensively sound version he had previously been. He also earned several Scottish caps when they gave them to high class footballers and not just the first eleven blokes to turn up. Another player about whom I have written previously and a key part of the excellent turn of the century side assembled by Harry Redknapp. Sinclair arrived from QPR in a wildly one sided swap deal that sent Iain Dowie and Keith Rowland the other way, and was soon banging in goals all over the place as he settled immediately. Over time he would eventually establish himself as a genuine winger, and even played as a wing back for a while when Redknapp eventually bought so many attacking players that he just started coming up with formations that included fewer defenders. Sinclair was a great team man, and his versatility and unselfish attitude made him popular with team mates and fans. He also had an eye for the spectacular goal as evidenced by this obscenely underrated effort against Derby. While Sinclair was held in high esteem locally, he struggled for a wider national appeal until he eventually forced his way into the England World Cup squad of 2002. For a man who managed just 12 caps, he couldn't have timed them much better and he duly played his part in a decent England run that ended in a quarter final defeat to Brazil. For his skill and athleticism, and a keen eye for goal, I rate Sinclair as one of our modern greats and a fine heir to Clyde Best in terms of black players to appear for the club. Another hero. From one to another. 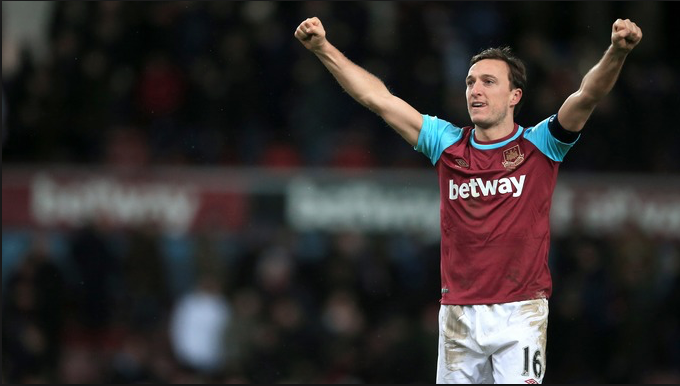 From his introduction as a fresh faced teenager under Alan Pardew, to his latest incarnation as an enduring veteran captain, Noble has been a steadfast presence in the centre of our midfield. In a world of ever changing landscapes, he has been a man of constant steadiness and remarkably similar haircuts. Notice the lack of pitch invaders. All dealt with. After becoming the youngest ever reserve team player at the age of 15, he played well for Pardew in the promotion season of 2005, but truly established himself as a first teamer during the Great Escape of 2006. This marked the first of a number of times when Noble would raise his game when surrounded by elite players. It isn't a coincidence to me that his best seasons have come when Carlos Tevez, Scott Parker and Dimitri Payet were around to help him. As the years have rolled by his legs have slowed, but he has maintained a continued level of performance and has been continually picked by a succession of managers. He has probably suffered a little because he has never been a pure playmaker like Brooking or Bishop and never had a physical presence like Bonds. Instead he has been gradually converted to a deep lying midfielder charged with starting moves rather than shaping them, while continuing the club's tradition of having high quality penalty takers. He was Hammer of the Year in 2012 and 2014, and runner up in 2005 which is a testament to his longevity. He might have won a couple more too but for Scott Parker's incredible run of form before that. It isn't easy to play for so long at the highest level and I've always wondered if part of the problem for Noble has been how heavily he is invested in West Ham. The kid who walked to games from his house in Beckton seems to have lived and died with the teams results in the same way as we all do. And as we can attest, it's exhausting. This came to a head last year when he ended up manhandling a pitch invader during the Burnley debacle, and seemed to be almost worn down by the continued drama that surrounds the club. No matter what happens from here, and whether he survives the Pellegrini era, he has been a tremendous servant to the club and a much underrated player both by West Ham fans and the wider footballing public. He should change his hair. Gulp. I can see the pitchforks from here. I should start by saying that Di Canio was a wonderful player. When he was in the mood he was a champagne footballer in a beer tavern. Not blessed with great pace or any particular physical attributes, he instead relied on incredible close control and dribbling ability and was our most consistent source of goals and assists for his five year stint with us. He arrived in 1999 and galvanised Harry Redknapp's excellent team to a 5th place finish. Essentially replacing Ian Wright, he started up profitable partnerships with first Paolo Wanchope and then Frederic Kanoute, and enjoyed a particularly good link with Trevor Sinclair that saw the latter score plenty of goals as a late arriving winger. But as Di Canio's influence grew so too did the team seem to wane around him. Redknapp essentially geared the side totally toward him, which would have been potentially fine but for his unfortunate habit of missing tricky away games that he didn't fancy. In his five seasons at West Ham, he made one away league appearance each at Manchester United, Liverpool and Leeds, and never played once at Newcastle. It is one thing to build your team around a player - it is another altogether if that player doesn't always want to be in the team. What most fans dismissed as Paolo being mad, mostly struck me as a self centred streak that damaged the team and impinged on the development of players like Joe Cole and Frank Lampard Jr.
For all that, when he was playing, we were generally free flowing and fun to watch. Di Canio scored famous wonder goals at Chelsea and at home to Arsenal, and scored one of the greatest goals in Premier League history with his scissor kick against Wimbledon. It remains the single best goal I have ever seen, and is a salutary reminder that he was a player who could lift you out of the gloom and into the night sky. There is no denying that he was an iconic player and a huge fan favourite but I could not justify placing him any higher given that element of his play. The ironic thing is that he really suffers here as a result of me knowing so much about him. Had he played in 1930 he'd probably be in the top ten. Or quite possibly a Mussolini black shirt. It's hard to know.